So, this is Arthur, my workstation, while I was installing a new cooling loop. So, let's break this sucker down. The CPU. I'm not too hot on the money vs. utility for Intel, so you'll need to do your own homework on that brand. While more expensive than AMD, Intel is more efficient when it comes to heat output. I use AMD processors...inexpensive, simple, but they need to be installed carefully. I recommend a quad-core chip if you can find them for cheap. Not top-of-the-line but they will give you good power for most things. RAM. I'd recommend 8GB in two 4GB modules to give you the least amount of headaches. I'm running with 16GB because of the high-end stuff I do. Mainboard. This is kinda tricky at times, but I recommend looking into Asus or MSI. Both brands are reliable. What you want to look for is the physical framework (where all the ports are) and whether or not it has onboard graphics. While this can save you some money, if you're doing things more advanced than playing video games, you might want to save money by looking for a mainboard without onboard graphics and spending a little extra on a video card. I use a 970A-G46 mainboard. Power supply. Look for those with the gold-silver-bronze ratings because any one of those will keep your computer from being a total loss in the event of a catastrophic failure. Also, when you build your system, keep track of wattage requirements (if you underestimate your needs with your power supply, expect a lot of blue screens of death!). 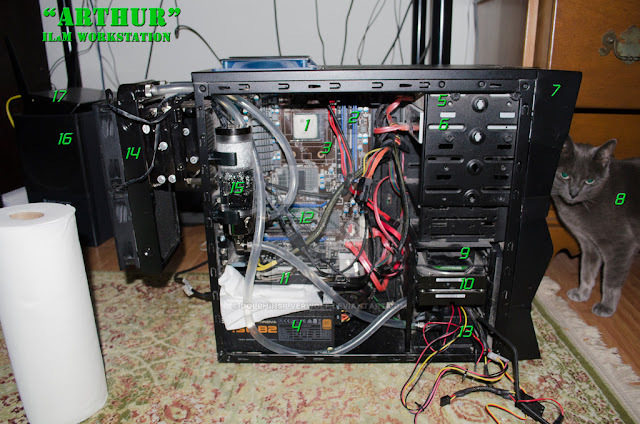 Look at the wattage needs of the CPU and the graphics card especially! I run with a 750W power supply, but that's because I'm running an 8-core processor. You probably won't need that much. A lightscribe DVD drive I salvaged from Arthur's original chassis. It's good for DVD's and lightscribe discs. An LG blu-ray drive. This sucker will burn anything to date, up to the largest capacity blu-ray disc and the CD-PROM MODISC format. Ah yes. You need a good case. A gaming-grade mid tower can be had for about $50. It's not just the inspection window you want...it's AIRFLOW. If you're looking at the front of the case, you want air to flow front to back, bottom to top, outside to inside. You want to route cables away from the inside of the case as much as possible. Cat. You should have one. Or, if you're more into dogs, adopt a wolf. Solid-state drive. This isn't big enough to hold EVERYTHING, but it's big enough to hold the OS and every demanding application. AutoCAD, Photoshop, Daz Studio, Sony Creative Suite, Maya, etc.. Conventional HDD's. Slower than the SSD, but they hold lots of data economically. It's the same principle used at the San Diego Supercomputer Center (biggest supercomputer cluster west of the Mississippi river...probably biggest in the USA now, I dunno)...they have a huge tape silo capable of massive amounts of storage. Not too fast, but it's stored. Graphics card. Balance your budget vs. performance, but I recommend at least 2GB of onboard RAM, DDR (highest number you can find). Check the benchmarks on the web before you buy. My capture card. AVerMedia. Support is a pain, but it works. Now we're into the interesting bits. Cooling. A liquid cooling system for the CPU is awesome...but mostly you should be able to get away with an all-in-one self-contained rig. I went custom because my case wouldn't hold a self-contained cooling loop. I have a radiator that I salvaged off of a LEPA Exllusion cooling system (great rig, lasted a year but once the reservoir cracked, it was toast) and a Phobya cooling kit. This is the pump. And this is a salvaged radiator. Reservoir. This is needed to make sure you have enough coolant through the system. Also, one of those plugs has a silver tip, ensuring silver ions permeate the coolant, killing algae before it can grow and clog the loop. An Altec Lansing speaker kit. Still hasn't failed me. A router. I handle IT for my household.